In recent months, the Japanese government has made increasingly aggressive moves challenging memorials dedicated to the victims of the Japanese military “comfort women” system not just in front of the Japanese Embassy in Seoul or the Japanese Consulate in Busan, South Korea, which Japanese officials argue violate the Vienna Convention on Diplomatic Relations protecting the “dignity” of diplomatic missions, but anywhere in the world. The latest development in this trend is the amicus curie brief the Government of Japan filed in the lawsuit Gingery et al. 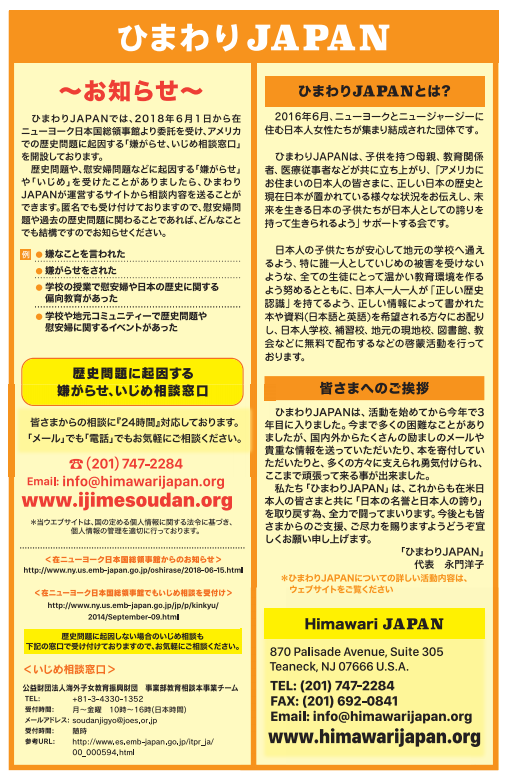 v. City of Glendale on behalf of the Global Alliance for Historical Truth (GAHT), a Japanese far-right extremist group. GAHT filed a lawsuit against the City of Glendale, California in 2013 after the city installed a memorial dedicated to the victims of Japanese military “comfort women” system. The suit was widely criticized by Asian American communities including local Japanese American groups, legal experts, and others, and resulted in a series of defeat by GAHT including penalties under California’s anti-SLAPP statute against frivolous lawsuits designed to stifle free speech. On January 9, 2017, GAHT filed a request to the U.S. Supreme Court to reconsider the appeal court’s decision against them. For the Supreme Court to take up a case, four out of nine (currently eight due to the passing of the late Justice Antonin Scalia) justices must agree to hear the case, and they do so only in about 1-2% of the cases each year. In the amicus curie brief filed on February 22, 2017, the Government of Japan criticizes not just the constitutionality of Glendale’s installment of the memorial that, in their view, “disrupt[s] the United States’ foreign policy” and “presents a significant impediment to Japan’s diplomatic efforts” as “the monument is not inline with the spirit of” the Japan-ROK Agreement (2015), but also “the inscription on the Glendale monument” itself. “Japan strongly disagrees that the inscription on the Glendale monument accurately describes the historical record, which Japan has studied at length,” the amicus states. Attorney Jessica Ellsworth, a registered foreign lobbyist at the law firm Hogan Lovells which the Japanese government uses, served as the counsel of record for the Japanese government. In October 2015, Hogan Lovells set up an apparent astroturf (i.e. a public relations campaign disguising itself as a “grass-roots” civic group) Voices of Vietnam, which appeared out of nowhere, purchased a full-page color ad on the Wall Street Journal and held a press conference at the National Press Club to coincide with the visit of the President of South Korea criticizing the Korean military sexual violence against Vietnamese women during the Vietnam War. The press conference featured the former U.S. Senator Norm Coleman, also a lobbyist working for Hogan Lovells. Voices of Vietnam has been inactive ever since. Former Japanese MP threatens to bomb Comfort Women memorials in the U.S. 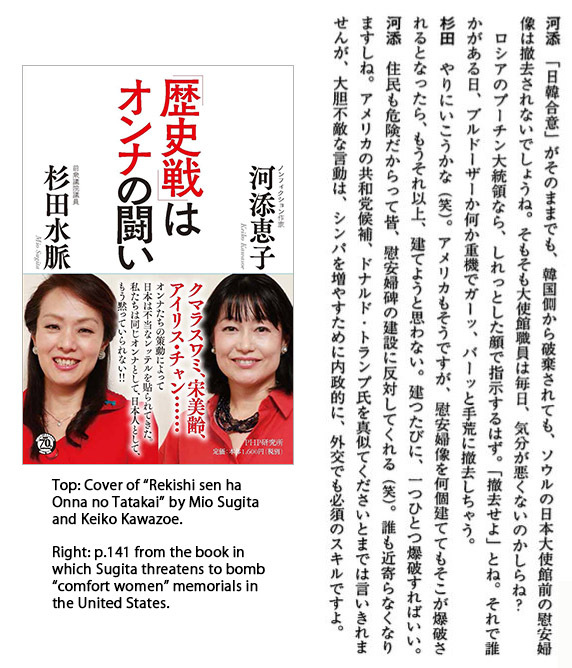 In a recently published book, former Japanese member of parliament Mio Sugita threatens to bomb “comfort women” memorials in the U.S. as they are built. The book, “Women Fight the History War” (Rekishisen ha onna no tatakai), is a dialogue between Sugita and Keiko Kawasoe, a non-fiction writer. 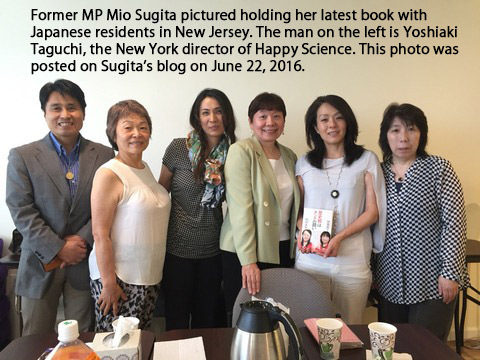 Sugita has very recently (June 21, 2016) visited the sites of “comfort women” memorials in Palisades Park and Hackensack, both in New Jersey, just as the book calling for the bombing of these memorials went to press (June 22, 2016). In 2013, Sugita visited Glendale, California to meet with representatives of local Japanese American groups, which have endorsed the “comfort women” memorial in the city. After the meeting, she lambasted Japanese Americans for being “typical leftists” who made no sense. Sugita has participated in far-right Japanese lobbying efforts at the United Nations in the last few years, giving speeches at the United Nations Committee on the Elimination of Discrimination Against Women (CEDAW) and at the Commission on the Status of Women (CSW) NGO Parallel Events in which she denied the Japanese military sexual slavery during the WWII. Has the establishment of “comfort women” memorials in the U.S. led to widespread bullying against Japanese children? 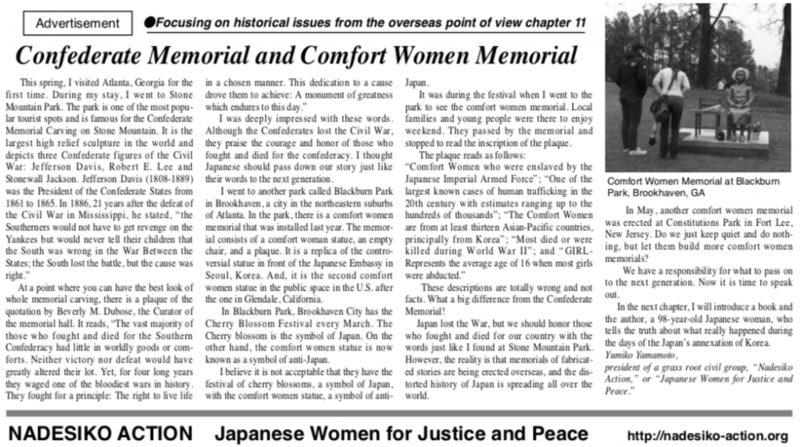 Conservative media in Japan have repeatedly claimed that the bullying and harassment against Japanese and Japanese American children have become rampant after a memorial dedicated to the victims and survivors of Japanese military “comfort women” system was enacted in Glendale, California in 2013. But there is no basis for this claim. 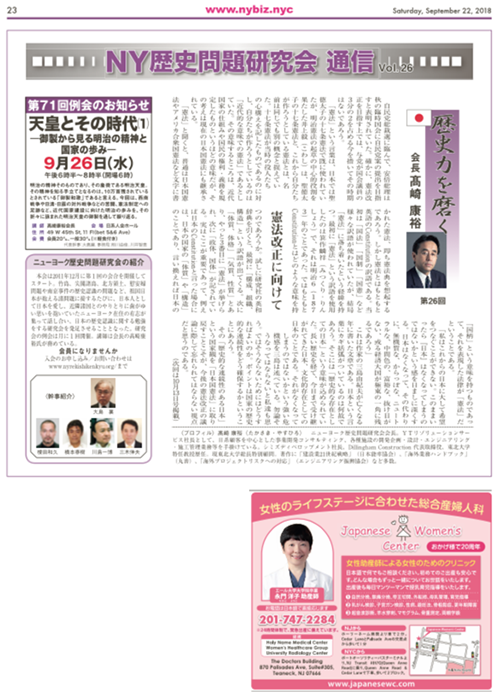 Since the stories about the supposed “bullying” of Japanese children began appearing in conservative publications in Japan, many local, national, and international media outlets have tried to substantiate the claim but to no avail: schools, law enforcement agencies, Japanese American community groups, and others could not identify a single report of such bullying. Even conservative Japanese politicians who visited Glendale in hope of meeting with the victim or their families could not find any. A Japanese residing in Los Angeles made a number of telephone calls on my behalf. A teacher at a school for Japanese children told him that the school had heard about the bullying story and had sent out a note asking for parents to report any incidents, but no one did. Of course, lack of reports does not necessarily indicate that there is no bullying at all, but the conservative media’s claim of rampant or pervasive bullying against many Japanese or Japanese American children is demonstrably false. Japanese “Comfort women” deniers often cite “Comfort Women of the Empire,” a book written by Yuha Park of Sejong University, South Korea, to claim that the average age of “comfort women” was “around 25,” and therefore memorials that depict teenage victims (such as the one in Glendale, California) are misleading. Definitive data is unavailable, but Park’s claim is not supported by the evidentiary source material that she invokes. “Comfort Women of the Empire” was published in Korea in 2013 and then in Japan in 2014. Since the publication of the original version in Korea, Park has been the target of civil and criminal cases in court for allegedly libelous statements toward survivors of the Japanese military “comfort women” system, which forced her to redact portions of the book in Korea. The controversy over the state intervention on an academic publication is ongoing, distinct from the controversy over the content of the publication itself. The English version of “Comfort Women of the Empire” is reportedly in the works. There are third party “summaries” of the book available for download at various (right-wing Japanese) websites, but the author has specifically stated that many of them distort her work. 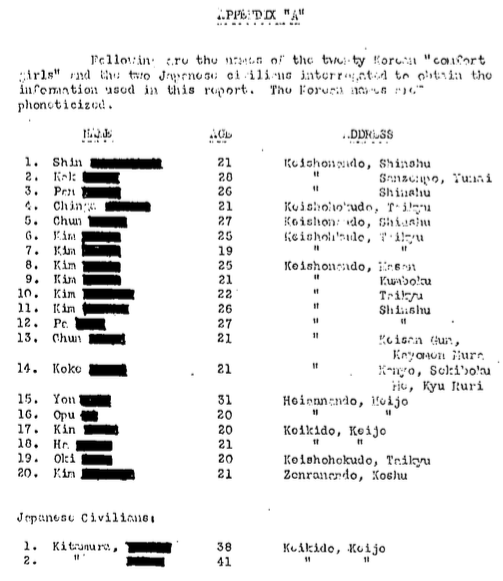 On pages 64-65 of the Japanese edition of “Comfort Women of the Empire,” Park cites a 1944 U.S. military prisoner of war interrogation report (which is itself often misused by the right-wing camp) as an evidence that the typical age of “comfort women” was “around 25,” challenging the historical consensus that a large number of “comfort women” were minors at the time of their recruitment. 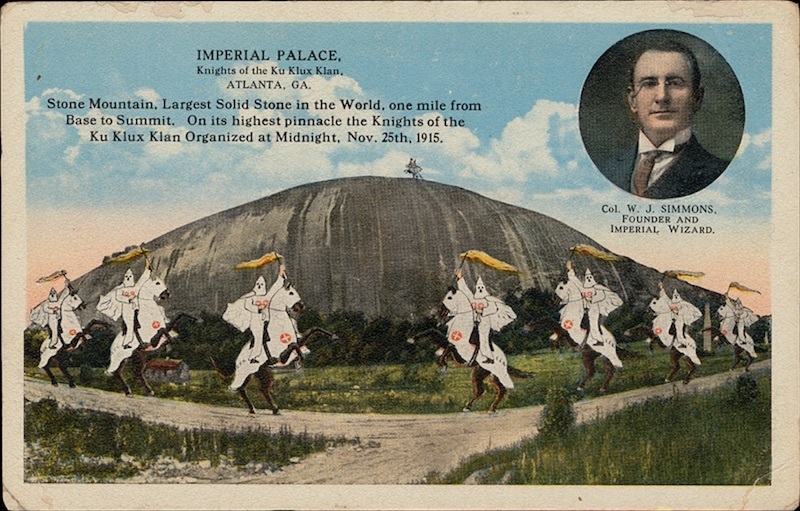 This is an important point for those who are concerned about the potential violation of international law by the Imperial Japan because the 1921 International Convention for the Suppression of the Traffic in Women and Children required signatories including Japan to prohibit the transportation of women and children under age 21 across national borders for the purpose of prostitution, even with their consent. Further, because the women were recruited and forced to become “comfort women” two years before they were interviewed by the U.S. military according to the report, the real median age at which they were recruited is 19. In fact, 12 out of the 20 women listed were under 21 at the time of recruitment. While these numbers cannot be generalized to all “comfort women” or perhaps even to all Korean “comfort women,” they do suggest that it was not uncommon for Korean “comfort women” to be trafficked while they were underage, in clear violation of the international law at the time. 2016-03-16 Mera,Hosoya, and Sugita hold a panel titled “Misunderstood Comfort Women” at the NGO Parallel Event coinciding with the U.N. Commission on the Status of Women in New York City. 2016-03-17 Mera, Hosoya, and Sugita hold a version of the above panel in Japanese for Japanese audience in New York City. 2016-03-23 Yamamoto, Fujiki, Fujii, and Norimasa Suzuki (Seiron-no-Kai) hold an event featuring Marano at an Armenian Church.